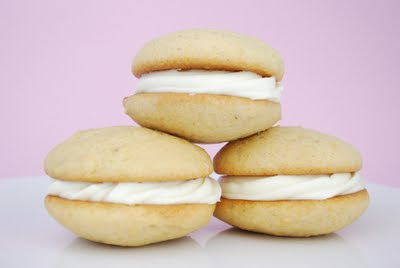 So I might have a slight whoopie pie obsession﻿. I may or may not sit at work and write down possible variations that I want to bake. Lemon, chocolate chip, orange creamsicle, salted caramel, strawberry, key lime, mocha...I could go on. When I saw these in Martha Stewart's annual holiday cookie magazine, my first thought was that banana whoopie pies didn't seem very Christmas-y to me. After making them, I realized it didn't matter what the occasion, these babies are perfect for any time of the year. Preheat oven to 350 F. Whisk to combine flour, baking powder, baking soda, and salt in a bowl. In a separate bowl, mix together banana and sour cream. Beat butter and both sugars with an electric mixer on medium-high speed until fluffy, 3-4 minutes. Add egg and 1/4 tsp. vanilla, beating until incorporated. Add banana mixture in 2 additions, alternating with flour mixture. Transfer batter to a pastry bag fitted with a 1/2-inch plain tip. Pipe batter into 1 1/4 inch rounds on parchment lined baking sheets, spacing 1 1/2 inches apart. OR, you can do what I did and use a medium sized ice cream scoop! To make filling, beat cream cheese, confectioners' sugar and remaining 1/2 tsp. vanilla with an electric mixer on medium speed until smooth, about 2 minutes. Pipe or spoon about 1 T. cream cheese mixture onto flat sides of half the cookies. Sandwich with remaining cookies. By using my medium sized ice cream scoop, I got about 15 or so whoopie pies. These look really yummy! I wish I had one right now! All of those variations sound wonderful. Let me know if you need a taste tester!